Samsung Recalls Galaxy Note 7 Over Exploding, Burning Batteries : The Two-Way After the device launched in early August, dozens of users reported that their waterproof smartphones caught fire or exploded. Samsung traced the problem to its battery and promises replacements. 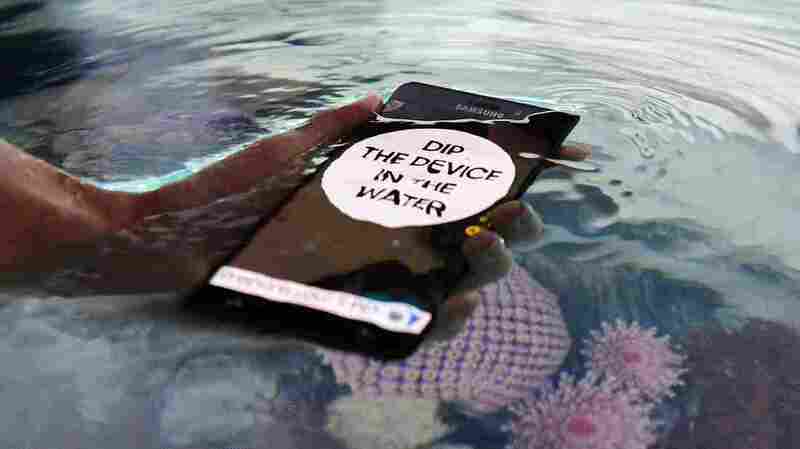 The Galaxy Note 7 — shown at the IFA electronics trade fair in Berlin on Wednesday — is waterproof, as this demonstration was designed to highlight. But it turns out users might have another reason to drop it in water: Several dozen users have seen their phones catch fire, or even explode. Samsung Electronics is recalling its brand-new smartphone, the Galaxy Note 7, after dozens of users reported the devices exploded or caught fire. Samsung traced the problem to a flaw in the phone's lithium battery, and issued a voluntary global recall. Samsung is offering to replace all 1 million devices already in the hands of consumers in 10 countries, and it's recalling the shipments of the Galaxy Note 7 that have already gone out. One country isn't included in the recall — China. The AP reports that, according to Samsung, the Galaxy Note 7s sold in China used a different battery that wasn't affected by the flaw. "The recall, the first for the new smartphone, comes at a crucial moment in Samsung's mobile business," the AP reports. "Apple is scheduled to announce its new iPhone next week, and Samsung's mobile division was counting on momentum from the Note 7's strong reviews and higher-than-expected demand." The Galaxy Note 7 has a large screen — some call it a "phablet," part phone, part tablet — and is waterproof. Samsung hopes to resume sales once the battery problems are worked out. Koh Dong-jin, president of Samsung's mobile division, told reporters the problem that caused the faulty batteries was difficult to identify in quality control. The recall "will cost us so much, it makes my heart ache," he said, according to the AP. "Nevertheless, the reason we made this decision is because what is most important is customer safety." Samsung says it knows of at least 35 instances of exploding or burning batteries. No injuries have been reported, the AP says. QUIZ: Do You Have What It Takes To Work For Samsung?